Ferdinand VII, King of Spain, the eldest son of Charles IV, King of Spain, and of his wife Maria Louisa of Parma, was born at the palace of San Ildefonso near Balsam in the Somosierra hills, on the 14th of October 1784. The events with which he was connected were many, tragic and of the widest European interest. In his youth he occupied the painful position of an heir apparent who was carefully excluded from all share in government by the jealousy of his parents, and the prevalence of a royal favorite. National discontent with a feeble government produced a revolution in 1808 by which he passed to the throne by the forced abdication of his father. Then he spent years as the prisoner of Napoleon, and returned in 1814 to find that while Spain was fighting for independence in his name a new world had been born of foreign invasion and domestic revolution. He came back to assert the ancient doctrine that the sovereign authority resided in his person only. Acting on this principle he ruled frivolously, and with a wanton indulgence of whims. In 1820 his misrule provoked a revolt, and he remained in the hands of insurgents until he was released by foreign intervention in 1823. When free, he revenged himself with a ferocity which disgusted his allies. In his last years he prepared a change in the order of succession established by his dynasty in Spain, which angered a large part of the nation, and made a civil war inevitable. We have to distinguish the part of Ferdinand VII in all these transactions, in which other and better men were concerned. It can confidently be said to have been uniformly base. He had perhaps no right to complain that he was kept aloof from all share in government while only heir apparent, for this was the traditional practice of his family. But as heir to the throne he had a right to resent the degradation of the crown he was to inherit, and the power of a favorite who was his mother's lover. If he had put himself at the head of a popular rising he would have been followed, and would have had a good excuse. His course was to enter on dim intrigues at the instigation of his first wife, Maria Antonietta of Naples. After her death in 1806 he was drawn into other intrigues by flatterers, and, in October 1807, was arrested for the conspiracy of the Escorial. The conspiracy aimed at securing the help of the emperor Napoleon. When detected, Ferdinand betrayed his associates, and grovelled to his parents. When his father's abdication was extorted by a popular riot at Aranjuez in March 1808, he ascended the throne -- not to lead his people manfully, but to throw himself into the hands of Napoleon, in the fatuous hope that the emperor would support him. He was in his turn forced to make an abdication and imprisoned in France, while Spain, with the help of England, fought for its life. At Valançay, where he was sent as a prisoner of state, he sank contentedly into vulgar vice, and did not scruple to applaud the French victories over the people who were suffering unutterable misery in his cause. When restored in March 1814, on the fall of Napoleon, he had just cause to repudiate the impracticable constitution made by the cortes without his consent. He did so, and then governed like an evil-disposed boy -- indulging the merest animal passions, listening to a small camarilla of low-born favorites, changing his ministers every three months, and acting on the impulse of whims which were sometimes mere buffoonery, but were at times lubricous, or ferocious. The autocratic powers of the Grand Alliance, though forced to support him as the representative of legitimacy in Spain, watched his proceedings with disgust and alarm. "The king", wrote Gentz to the hospodar Caradja on the 1st of December 1814, "himself enters the houses of his first ministers, arrests them, and hands them over to their cruel enemies"; and again, on the 14th of January 1815, "The king has so debased himself that he has become no more than the leading police agent and jailer of his country." When at last the inevitable revolt came in 1820 he grovelled to the insurgents as he had done to his parents, descending to the meanest submissions while fear was on him, then intriguing and, when detected, grovelling again. When at the beginning of 1823, as a result of the congress of Verona, the French invaded Spain, "invoking the God of St. Louis, for the sake of preserving the throne of Spain to a descendant of Henry IV, and of reconciling that fine kingdom with Europe", and in May the revolutionary party carried Ferdinand to Cadiz, he continued to make promises of amendment until he was free. Then, in violation of his oath to grant an amnesty, he revenged himself for three years of coercion by killing on a scale which revolted his "rescuers", and against which the Duke of Angoulême, powerless to interfere, protested by refusing the Spanish decorations offered him for his services. During his last years Ferdinand's energy was abated. He no longer changed ministers every few months as a sport, and he allowed some of them to conduct the current business of government. His habits of life were telling on him. He became torpid, bloated and horrible to look at. After his fourth marriage in 1829 with Maria Christina of Naples, he was persuaded by his wife to set aside the law of succession of Philip V, which gave a preference to all the males of the family in Spain over the females. His marriage had brought him only two daughters. When well, he consented to the change under the influence of his wife. When ill, he was terrified by priestly advisers, who were partisans of his brother Don Carlos. What his final decision was is perhaps doubtful. His wife was mistress by his deathbed, and she could put the words she chose into the mouth of a dead man -- and could move the dead hand at her will. Ferdinand died on the 29th of September 1833. It had been a frequent saying with the more zealous royalists of Spain that a king must be wiser than his ministers, for he was placed on the throne and directed by God. 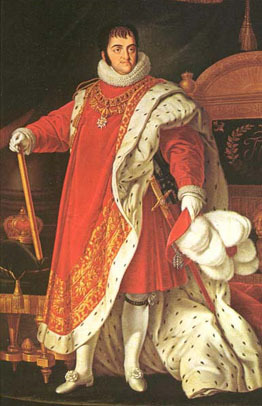 Since the reign of Ferdinand VII no one has maintained this unqualified version of the great doctrine of divine right. King Ferdinand VII kept a diary during the troubled years 1820-23, which has been published by the count de Casa Valencia.